This pattern is available for an instant download. Once payment is received, etsy will send you an email. In it will be a link to download the pattern. Pattern is easy for beginners and written in American crochet terms. 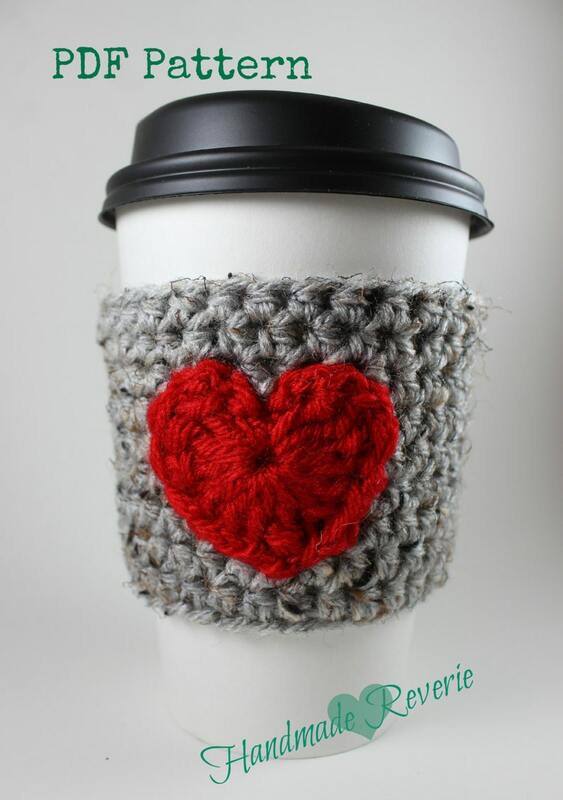 The finished project is a super cute re-useable heart cup cozy. Great way to keep from burning your hands on your hot drink or even keep your hands dry from the condensation on your iced drinks. So handy, just keep it in your purse for your morning coffee or tea. Completed cozy should fit most to go cups and even plastic tumblers. There are no refunds on my patterns because once they are emailed to you there is no way to return it. If you have questions or need help understanding anything in the pattern please convo me. Or send me an email. I'm happy to help. This pattern and photos are designed and copyrighted by Handmade Reverie. Pattern may not be distributed in part or whole in any way. You have permission to sell the items that you make using this pattern, all that I ask is that you include a link to my shop in the item listing. Wonderful pattern! Easy to follow and understand. Thank you! I accept all major credit cards through PayPal or direct check out as payment. I want you to love your purchase! If for any reason, you are unsatisfied with the quality of workmanship or the product itself, please contact me immediately. I am happy to exchange your item for one of equal value free of charge upon the return of the originally purchased item (you pay return shipping). If you prefer a refund, I will refund your original payment upon return of your original purchase, minus shipping costs. Refunds will be given to the Paypal account the original payment was made from.